The site plan as well as the zoning for a proposed retail development at 3600 Plymouth Road, just west of US-23, has received final approval from the Ann Arbor city council. The vote on The Shoppes at 3600 came at the council’s March 18, 2013 meeting. 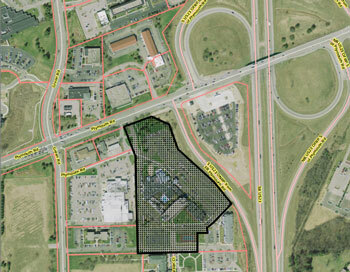 Aerial map of the location for The Shoppes at 3600, located off of Plymouth Road west of US-23. The developer hopes to build a 9,490-square foot, one-story retail building, to be constructed in what’s now the parking lot and front yard for a hotel, at an estimated cost of $1 million. The building would have space for several businesses, including a restaurant with a one-lane drive-through window and outdoor seating. An existing shared driveway off of Plymouth Road would be used to access the site. The site plan calls for 33 parking spots and four covered bike parking spots near the entrance. The March 18 vote on the site plan and the rezoning – from R5 (motel-hotel district) to C3 (fringe commercial district) – followed an initial vote of approval for the zoning at the council’s Feb. 19, 2013 meeting. Voting against the rezoning on the initial consideration was Stephen Kunselman (Ward 3). His was also the lone vote of dissent on the site plan approval. The planning commission had recommended approval at its Jan. 15, 2013 meeting. The project had been postponed by the commission on Nov. 7, 2012. The site is located in the same complex as the Holiday Inn North Campus. Responding to some planning commissioner concerns voiced at the November 2012 meeting, the developer had provided an alternative site plan that was reviewed on Jan. 15. But the developer sought approval for the original layout. The owner is listed as Ann Arbor Farms Hotel Corp., with property being developed by Diverse Development in Holland, Ohio.